Is the Ryder Cup the ultimate in team sport ? 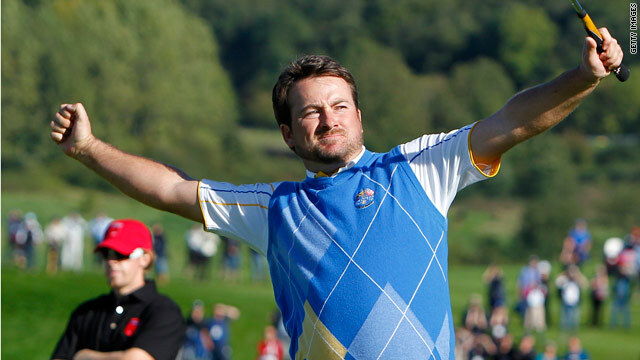 Graeme McDowell has that winning feeling after beating Hunter Mahan in their crucial singles match at Celtic Manor. Forget the rain delays or the row over ticketing arrangements for the final unexpected day of play at Celtic Manor, the Ryder Cup has cemented its status as the biggest and best one-off team event in world sport bar none. It brings together a collection of multi-millionaires, who spend their whole year in pursuit of individual glory, to play for their country, or in Europe's case their continent, with no prize money at stake. But boy, does it not mean a lot to those who are taking part. Who can forget Jeff Overton's frenetic celebration as he holed his approach shot for an eagle on Sunday ? Or the sheer joy on the faces of Northern Ireland pair Rory McIlroy and Graeme McDowell as they closed out a vital victory in the European fightback, inspired by a team talk from skipper Colin Montgomerie. McIlroy now gets it. Last year he made unflattering comments about the Ryder Cup, saying the majors were far more important. After holing a nervy five-footer for a crucial half against Stewart Cink, he admitted that playing in the Ryder Cup topped anything he had done in his meteoric career. Partner McDowell thought he knew all there was to know about pressure after winning the U.S. Open at Pebble Beach. But as events unfolded Monday that took on a new dimension as it became clear the whole outcome of the Ryder Cup rested on his shoulders. The experience of a few months ago proved invaluable as he kept his nerve to close out Hunter Mahan, spare a thought for him, to cue scenes of unbridled European jubilation. There were other heroes too. For Europe Ian Poulter underlined his reputation as a team golf player par excellence to lead their points tally with Luke Donald, who was steadiness personified. Three points apiece for both. While for the beaten U.S. team two men stood up to be counted. Tiger Woods and Steve Stricker were on the receiving end of a humiliating six and five defeat to Donald and Lee Westwood, but both came out to win crucial singles matches and take their tallies to three points. Tiger in his crushing victory over Francesco Molinari showed he is returning to his very best form, but this week has been all about the team and he gave his all for the U.S.
For the eventual outcome to come down to the very last match on course after four days of titanic struggle was a dream scenario for organizers, the fans and TV, but most of all for the game of golf. Corey Pavin and his team will be feeling the pain of defeat but in my opinion they are all winners for their part in one of the greatest Ryder Cup matches in history. No, the Mosconi Cup in pool is the ultimate team sport. I congratulate both teams for their intense battle. Special congratulations to Colin Mongomerie. I hope Colin understands that he does have a lot of fans in the U.S. and the world who appreciate his grace in winning along with his exuberance in winning. I have always felt he has been really misunderstood thoughtout the world and he is a real gentleman and sportsman. Congrats again for your whole team in victory! And congratulations to the U.S. Team for keeping your heads up and trying to win to the last breadth. You lost to a great team but you will always be winners and we appreciate your efforts! God bless you all! Agreed, one team may have won, and another team may have lost in an enthralling contest, but integrity and sportsmanship that define golf and the Ryder Cup were the true winners today. How can you even consider something like this so called "GOLF" a team sport. I mean do you see players passing golf balls to each other with their golf stick or something. Even the Ryder cup is more of Individual skill rather than team skill. If your looking at ultimate team sports please take a look at sports called "SOCCER" and "BASKETBALL". I hope you know these two mentioned sports by me ? It is definately a team sport the Ryder Cup event. Why? Well first of all there is a captain and there a 12 players for each side. That makes it a team sport. In the foursomes and fourballs you play as a team. If you are not playing you are supporting your team mates. Something was clearly shown in the final matches. No US player returned to the clubhouse. And finally there were tears. Where else in the game of golf you will see tears when you end up second. I will remeber this 2010 Ryder Cup the rest of my live. ‘Living Golf’ is CNN’s monthly golf show, hosted by Shane O’Donoghue.